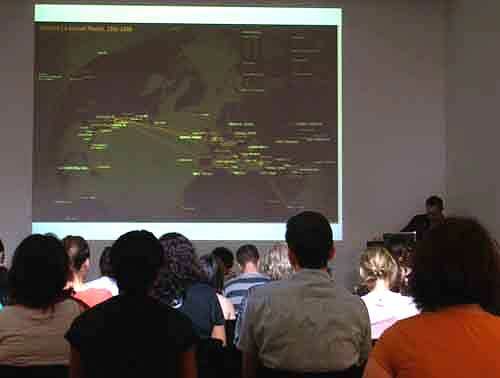 The dynamic, and sometimes changing schedule coalesced around the festival website at www.Confluxfestival.org and at the Conflux HQ, where lectures, meetings and projects took place, located this year at the Center for Architecture. 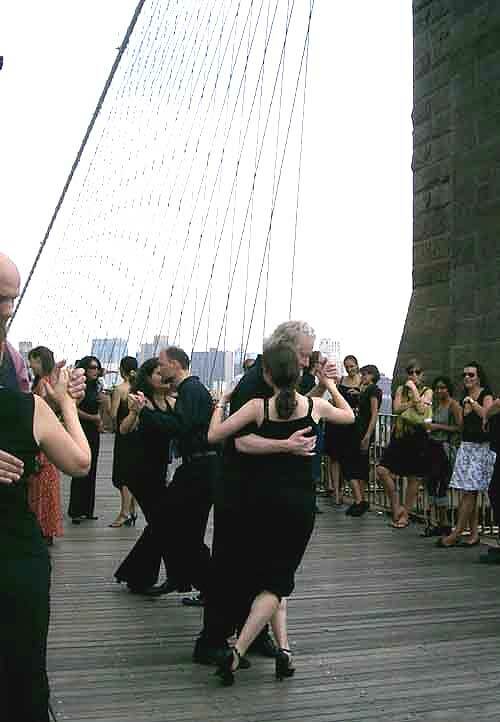 While zones in the streets of New York were identified for events near the Center for Architecture, many were “off-piste” so to speak, such as those made by Artists Meeting, a group of fourteen artists who made nineteen pieces all over lower Manhattan (www.artistsmeeting.org), or Tango Intervention, organized by artist Ro Lawrence, which gave participants a chance to tango on the Brooklyn Bridge, creating an exciting and different kind of social space for the walkway (www.tangointervention.org). In fact, over the weekend lower Manhattan was deluged by a wave of both digital and analog art events, many of which would have been barely perceptible to an unsuspecting public. In a piece called The Pick Up, artists Eleanor Eichenbaum Eubanks and Heather L. Johnson collected personal stories that took place at specific NYC locations, embroidered these memories on over twenty vintage handkerchiefs, and placed the handkerchiefs at the locations where the stories had originally taken place. The idea of making an introduction by way of picking up a handkerchief was resonant in the event. 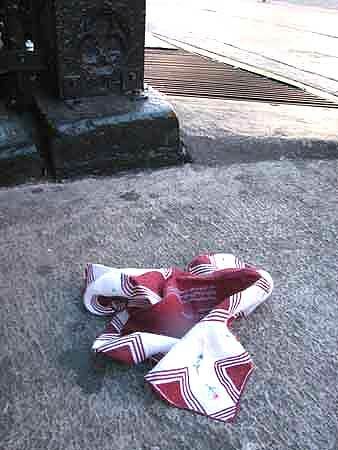 Members of the public are invited to search for these site-specific works and pick them up, using the website map as a guide, but the artists warn, for example, that two handkerchiefs left near the Chelsea Hotel disappeared within a matter of minutes of the drop, making after-the-fact searches potentially futile (www.thepickup.org). Brian House, who works with database driven narratives and their intersection with public space and whose work has been incorporated into the curriculum at Columbia’s Graduate School of Architecture, Planning and Preservation, created an interactive video piece called Today is OK that could be viewed by anyone in the vicinity of the Center for Architecture with a cell phone that had Bluetooth capability. The Federation of Students and Nominally or Unemployed Artists – $1k Giveaway, comprised of artists James Bachhuber, Angela Ferraiolo, Sam Freeman, Tamara Gubernat, Steve Lambert, Michael McCanne, Prescila Neri, Kahil Shkymba, Bob Smith, and Hal Weiss, set up a table over the weekend and gave out free artists grants to the public. Funds had been pooled together by the group from individual work activities leading up to the event. Anyone with a good idea for an art project could stand on line, describe it, put in an application and possibly receive instant funding. Soon local venders decided to join in and give things away as well. Maps and map-making played a big role at Conflux. In a panel discussion that centered around projects that were inspired by the book, Cartography of Protest and Social Change, graphic designer and activist John Emerson, explained that he uses maps to visualize and challenge power and to navigate abstract relationships. He presented the map he created in collaboration with artist/writer Trevor Paglen of the CIA’s secret international flights that transported hostages for rendition. The map was posted on a Santa Monica billboard. Questions such as, “who makes the maps?” and “how do we map ourselves?” were put forward by panel participants as a means of unraveling assumed power structures. Artist Lucas Murgida uses the way in which he earns his living, in this case cabinet-making, to make performances and interventions that engage the public and “their notions of service, perception, liberation, and derivations of power”. For this year’s Conflux Festival, in a project called 9/10, referring to the phrase “possession is nine-tenths of the law,” Lucas constructed a cabinet that he then left on a New York City street with himself inside. On Sunday morning, during one of the talks, he was taken. 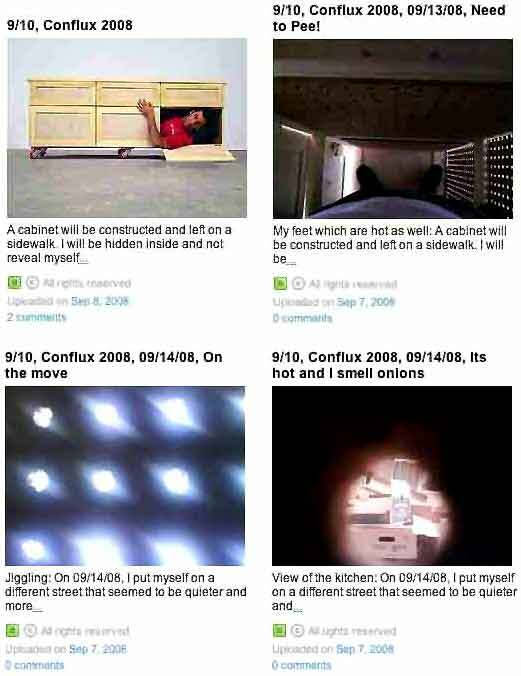 Lucas’ flickr site provided a real time record of his experiences and can be viewed at http://www.flickr.com/photos/lucasmurgida/. As Christina Ray now steps away from the Conflux Festival after five years as director, participants and supporters are waiting eagerly to hear what will become of the festival. Conflux is currently in its fifth year with no corporate or public funding, running almost entirely on a grassroots, volunteer basis with only some in-kind donations. At a time when freedom of the use of “public” space within the City is questionable due to big real estate and corporate interests and homeland security, the projects in the Conflux Festival come as a breath of fresh air, nudging at the edges of the control and ownership of communications systems, of our own habitual activities and the way we operate within the City’s systems. In these events we can see what isn’t normally seen, do what isn’t normally done, and learn about our expectations. Then, as Chris Carlsson says, we can “repopulate the technosphere and reappropriate what we do and why we do it”, a very exciting proposition indeed. 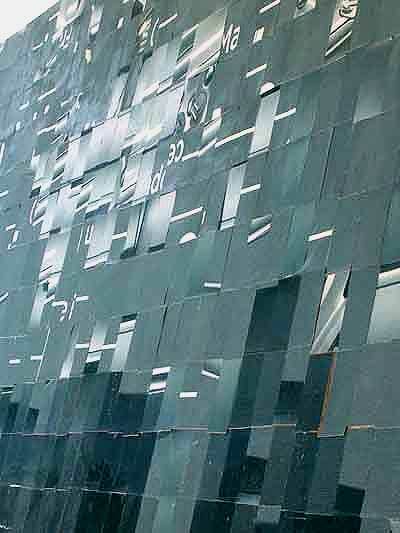 Jean Pike is an artist|architect living and working in New York City. She holds a Master of Architecture degree from the Yale School of Architecture. Her work has been shown at Viridian Artists Gallery in NYC, The California College of Arts and Crafts, The University of New Mexico School of Architecture and Planning Gallery, Tao Gallery in Hong Kong and Gallery 61 at The New York Institute of Technology. Her work is about translating between various forms of representation (abstract drawing, video) and three or four dimensional work (sculpture, architecture and installation). Coming from a background in dance, it is often about the physical sense of the body in space and time and how that relates to psychological and emotional states. The collective, J Mandle Performance, enlivened the outdoor space of the World Financial Center yesterday with a fun but also poignant piece called hopscotch. 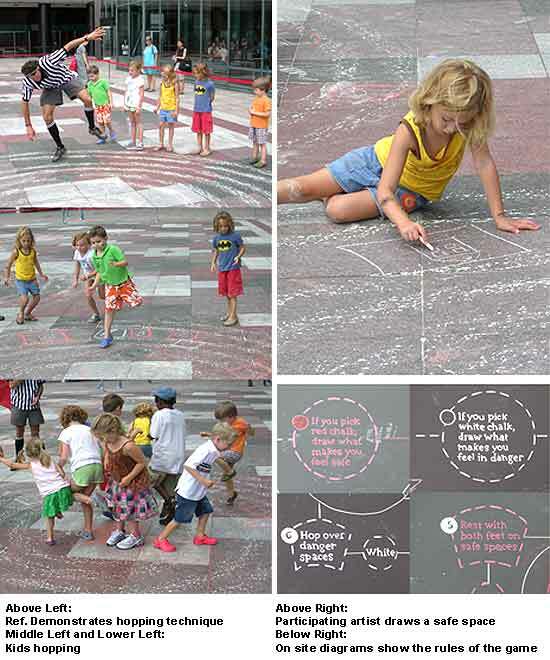 Dancers created the underlying line structures (spirals) with cast chalk shoes that were later augmented by kids as they chalked pictures of “safe” and “dangerous” spaces, making a map for a more difficult hopping game. 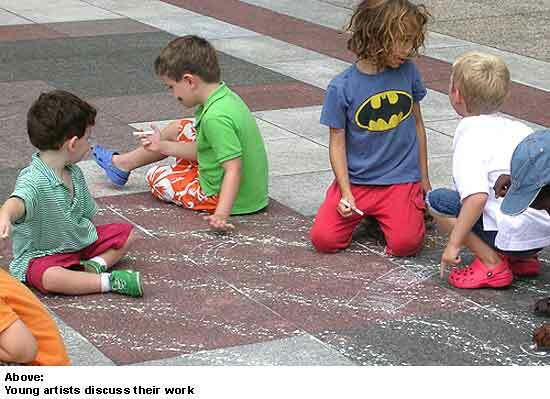 The kids didn’t hesitate for a millisecond as they dove into their task as artists. This piece is based on the early French version of hopscotch called Escargot which is played along a spiral path, but Mandle was interested to note that hopscotch originated as a military training exercise in Britain during the Roman Empire and was used to build speed and agility. 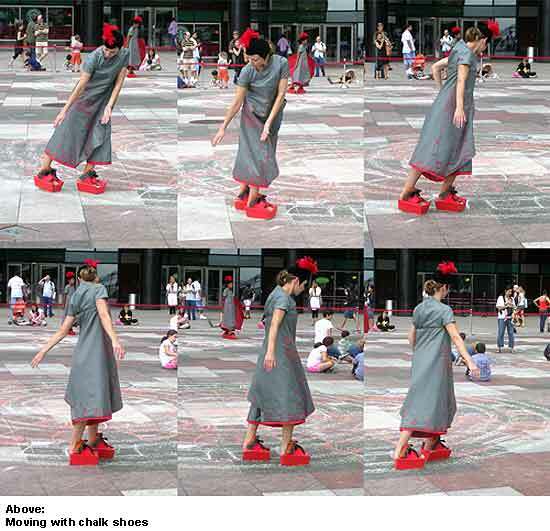 About the collective’s work, Mandle says, “I believe in the necessity of public interventions to create small shifts in perception, causing people to turn from one realm of meaning to another.” (interview, artkrush, 09/2007) Hopscotch gave us pause on Saturday. J Mandle Performance creates publicly accessible, often free, site-specific performances that seek to heighten the perception of everyday environments in both invited audiences and accidental passersby. Julia Mandle is the recent recipient of a NYFA Fellowship in Performance Art and numerous awards, including her earliest grant from Franklin Furnace Fund for Performance Art, and later from The Foundation for Contemporary Performance Art, New York State Arts Council and the National Endowment for the Arts. She has also been awarded recent artist?s residencies at Yaddo and Weir Farm Trust. She earned a Bachelor of Fine Arts at Williams College and a Master of Arts at the Gallatin School of New York University.Since founding J Mandle Performance Julia Mandle has pioneered the development of genre-defining, site-specific performance-installation. Named by the New York Times as “a promising force in New York’s art and performance scene”, Mandle seeks to help lead the expansion of performance art in meaningful directions. 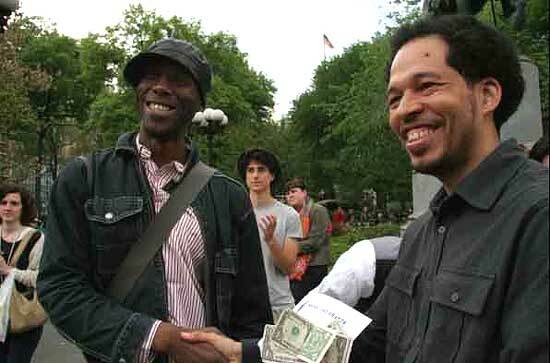 Hustle (2005) was included in an exhibition voted ‘Best of 2005′ by both Michael Kimmelman of The New York Times and Andrea K. Scott of Time Out NY. Julia has lectured at Rhode Island School of Design anf Pratt Institute, served on the Road Island Arts Council, and published her theories in several journals. She is the recipient of a NYFA Fellowship (2003), grants and awards from the NEA, NYSCA, and the Jerome and Greenwall Foundations, and residencies at Yaddo and Weir Farm Trust. Articles on Mandle’s work have appeared in the New York Times, Time Out New York, the Village Voice, The New Yorker, Architecture Magazine, and NYFA Quarterly. The Drawing Center has been a unique and dynamic part of New York City’s cultural life since 1977. The only not-for-profit institution in the country to focus on the exhibition of drawings, it was established to demonstrate the significance and diversity of drawings throughout history, to juxtapose work by master figures with work by emerging and under-recognized artists, and to stimulate public dialogue on issues of art and culture. Historical Exhibitions focus on both acknowledged and under-recognized masters (such as Michelangelo, J.M.W. Turner, James Ensor, Marcel Duchamp, and Hilma af Klint) while Contemporary Exhibitions illuminate unexplored aspects of works by major living artists (such as Richard Serra, Louise Bourgeois, Ellsworth Kelly, Anna Maria Maiolino, Ellen Gallagher, and Richard Tuttle), and Selections Exhibitions present innovative work of emerging artists who are contributing to new interpretations of drawing. In the Drawing Room, which was opened across the street from the main gallery in 1997, emerging and under-recognized artists are encouraged to create experimental, cross-disciplinary work and site-specific installations.